Master student New Media at the University of Amsterdam since September 2011. Gratuated (Bachelor) on Film-, Television and Communication Studies at University of Utrecht in June 2011. 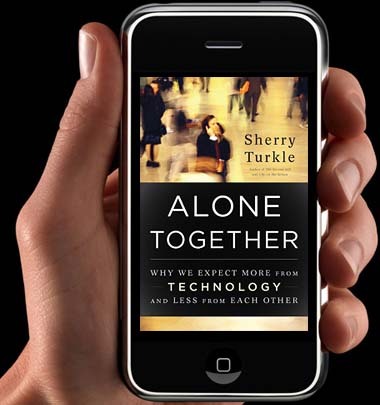 In Alone Together Turkle focuses on adolescents from five through their early twenties in the story of digital culture over the past fifteen years. The book is separate in two parts. The first half is about social robots and describes how to Turkle´s dismay people are enthusiastic about those. Turkle discusses here research to robotic toys as furby’s and Tamagotisch. She starts however with an anecdote which describes how she gets the feeling she’s one of the last persons which is negative about an robotic marriage. I must say althought this start directly got you sucked in to the book, to me this anecdote seems a bit exaggerated. The second half of the book is about us people being tethered with the World Wide Web, and separating ourselves from real life by being online at all times. Althought the situation of our society as Turkle describes is recognizable, I think her description is to emotional and typical one of her generation. This is especially a bad thing because her research focuses on the young public. She tells how this adolescents don’t understand her when she asks them about the negative consequences of their technological devices, or about being online all the time. So although she mentions a lot of good points with many recognizable anecdotes, her book as whole is very one-sided and therefore has a negative message towards our future society in relation to all the technological developments. While reading this book, I was shaping my own opinion about technology. I think it really isn’t a bad thing, but the development is gone too quickly for us people. From completely offline being online all the time (or being a cyborg as Turkle calls it). Perhaps we are in an ‘overwhelming’ phase and still have to become familiar with all these new possibilities. It’s I think someones own choice in which measure he’s online and pays attention to technological device, and although I think everyone recognizes the situations Turkle describes about being distracted from the real life by these devices, I would like to compare this behavior with the unlimited availability of food in stores. When the unlimited availability of food had arised in our society in the same short period as the development of technology, we probably would have had a similar situation. People would probably over-eat themselves because they’re not used to this degree availability (as perhaps many people still tend to do sometimes. In that sense the always-online-attitude seems to have a lot do with knowing where your boundaries are, and when you need to go offline. Constantly posting on your Facebook has something pathetic because this seems to mean you offline life doesn’t seem to be wearth giving your attention. Maybe it also shows someone can’t take pleasure out of reading a book or a good conversation or discussion with someone in your immediate real life environment. The phenomenon of ‘hype’ is easy to recognize here. At the moment all those new apps and on-line devices are great because they’re new and unknown, and have a lot of nice benefits. What Turkle seems to forget is people are able to learn from their experiences, or even mistakes. As a teenager I learned an important lesson from a short chat-addiction with the program MSN in my adolescence. I learned how nice it was to chat with my friends, sometimes during the whole night. Bud the next day on school, or at birthday parties / parties for friends / I couldn’t kep my eyes open . This is how I became quite young, aware of the temptations the World Wide Web can offer. I now sometimes see my mother get lost for a couple of hours after her computer, surfing from one website to another. To me this won’t happen anymore since I’m aware of how time passes by, and before you know it your day is gone. For me it’s comparing it with go shopping. When I go shopping and I know I don’t have much time I only go inside the stores from which I know I need to buy something, and won’t be distracted by other lead through windows. In our life full of freedom, choices and technology, people are stimulated more than ever to be aware of the choices you make or decied not to make. Perhaps a lot of us need to learn begin offline is no disgrace, and maby ‘Time Management’ in this is one of the biggest challenges of our time, but one in which we challenge to develop. So brought within a more positive way and contrary to Sherry Turlke in my opinion: Technology not only enriches our society in ways of communication bud also stimulates our self development.